With the conclusion of the 2019 IPL Player Auction, all franchises have built their strongest possible squads for the popular T20 tournament. While most selections were on expected lines, there were also quite a few surprises as uncapped players earned big money. Alongside Jaydev Unadkat, mystery spinner Varun Chakravarthy from Tamil Nadu fetched the highest amount of INR 8.4 crores in the event. As far as overseas players are concerned, Sam Curran created a flutter by going for INR 7.2 crores. All teams are looking good on paper after the auction. However, the following three teams have assembled the strongest of all squads when compared to the rest. RCB is one of the few teams who haven't won the IPL title yet. Despite possessing great players, they haven't been able achieve the expected results. Their batting has always been excellent but their bowling was always their weak link in previous seasons. But this time their bowling is also looking strong alongside their batting. Before the auction, RCB had traded Mandeep Singh for Marcus Stoinis while they had released Quinton de Kock, Chris Woakes, Sarfraz Khan, Brendon McCullum and Corey Anderson from their squad. 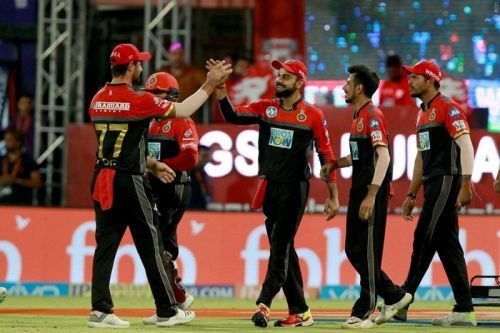 RCB had a good time in the IPL Auction 2019. They have made some good buys by picking up players like Shimron Hetmyer, Shivam Dube and Heinrich Klaasen in the auction. As far as RCB's squad is concerned their squad is looking well balanced for the upcoming season. Their batting department is looking very explosive as they have some very good batsmen like Virat Kohli, AB de Villiers, Shimron Hetmyer, Moeen Ali, Marcus Stoinis, Colin de Grandhomme in the squad. Virat Kohli and AB de Villiers will be their main batsmen this season. This season RCB's biggest strength will be their all-rounders. They have some very good all-rounders like Marcus Stoinis, Colin de Grandhomme, Moeen Ali, Shivam Dube, Akshdeep Nath, Gurkeerat Singh, Pawan Negi and Washington Sundar. These all-rounders will be very crucial for them if they want to win the title this time around. Nathan Coulter-Nile will be available for this season which will provide a much needed boost to their bowling attack. Last season, Umesh Yadav was exceptional with the new ball so they'll expect him to repeat the same this time as well. Mohammad Siraj had also bowled well in the last season. In addition to this they've some good fast bowlers like Tim Southee, Navdeep Saini, Marcus Stoinis. While Yuzvendra Chahal will be their main spinner who will be assisted by Washington Sundar, Moeen Ali and Pawan Negi.